Zegaku is a game app. by Redshirt Labs that contains number puzzles that are a blend of the popular Sudoku and Kakuro puzzles. To play, you have to choose a number from 1 to 9 to go in each box of the puzzle- rows must add up to the number that is on their left, and columns must add up to the numbers that are above them. When a circle is present in between two boxes, that indicates that the numbers on each side of the circle must be consecutive. Where no circles are present, the numbers will not be consecutive. Each number will only occur once in each row and each column. When you insert a number into a box, it initially appears as blue. If you decide to “check” your work by tapping the button at the bottom left of the puzzle, the numbers will change to red (incorrect) or green (correct). You can clear a puzzle at any time by tapping the button in the bottom right of the screen, or you can pause by tapping the button at the top left of the puzzle and resume play later by choosing “Resume” from the main menu. The look of the game is as the name suggests- very “Zen”. The main screen has what looks like a banzai tree branch overhanging the stones that function as the main menu buttons for Play/Resume/Help/Contact. The puzzles themselves have a cream/white/light green/dark green color scheme that is also very Zen and natural. I cannot say the game itself makes me feel very Zen, but I have always been horrible at number puzzles. Zengaku provides instructions and pointers both in the main screen “Help” option, and in the “Hints” section that can be accessed by tapping the button at the top right of the puzzle. These are both helpful, and give plenty of information for anyone to start playing. I just didn’t have the patience to complete any of the puzzles. If you are a patient number guru, Zengaku provides 60 total puzzles for you to conquer- 20 on each level (Easy/Medium/Hard). If you have any questions/comments/suggestions for Redshirt Labs, you can email them by pressing the “Contact” stone on the Zengaku main menu. The only thing that I might personally suggest to them is to add perhaps a smaller, easier starter puzzle for people like me to use so I can start to get the hang of it without having to undertake a super-puzzle right away. Besides that, I don’t see any real problems with the game besides the fact that people may want more than 60 puzzles to play. 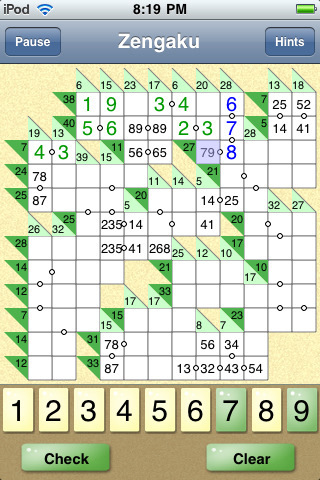 Zengaku is only $0.99 and will provide you with something different/more complicated than straight Sudoku puzzles. It’s a game that feels worthwhile and demands some reasoning and thinking, which is more than I can say for some game apps. So put down those silly games once in a while and get your Zengaku on! AppSafari review of Zengaku was written by Tyne Kennedy on April 13th, 2010 and categorized under App Store, Board, Fun, Games, Puzzler. Page viewed 6663 times, 1 so far today. Need help on using these apps? Please read the Help Page. We are going to be releasing version 1.1 pretty soon with some minor updates. We’re hoping to include a tutorial puzzle in version 1.2 – a smaller puzzle and hopefully an interactive walkthrough. Please don’t hesitate to send us feedback – your input helps us decide on what features to work on next. Version 1.1 is out. Also – We are happy to announce that Zengaku Lite is now available on iTunes. Try the puzzles out and decide if you want to upgrade. There is now version 1.2 which has added MINI puzzles that should help get people into the the game. So far the feedback has been great! Version 1.3 was just released. Check out the improvements we’ve made!